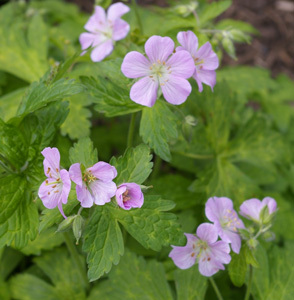 Joy Creek Photo Archive (c) all rights reserved Geranium maculatum 'Chatto' bears distinctly coarse, dark green, five-lobed leaves that have deep venation. The largest leaves are well over 5 inches across. The flowers are small and have white centers. This is very useful as a groundcover. This comes from the nursery of the famed garden writer and gardener Beth Chatto in England. Spring and summer. 20 in. x 24 in.